If you’re thinking that work demands are increasingly encroaching on your life at home … you’re not alone. According to the U.S. Department of Labor’s Bureau of Labor Statistics in survey results released earlier this summer, more Americans are using their weekends to get more done on the job. The results came from a survey that involved interviews with ~13,200 people over the age of 15. Non-self-employed persons in office or administrative positions are less likely to be working on weekends. Only 20% of those folks report doing weekend work, compared to ~82% of them working on weekdays either full- or part-time. But on a typical working day, nearly one in four employed Americans reported that they do at least some of their work at home. Not surprisingly, self-employed people are likely to do so, but those working in business management are more likely to do so as well. The BLS reports that employed men spend, on average, 8 hours and 9 minutes per day on work or work-related activities. That’s a bit more time than employed women spend on work-related activities (their daily average was 7 hours and 26 minutes). However, the trajectory appears to be upward for women and downward for men … so it may not be long before any difference between the genders completely disappears. And for those people who work more than one job … that’s where weekends have lost most of their meaning as a time for R&R, because fully half of the people with multiple jobs find themselves working weekends. As things evolve, it’s becoming pretty clear that the “Protestant Work Ethic” for which our society is so well known remains pretty robust, 200+ years on. For some folks, as their working years grind on, they might be thinking that the whole enterprise has become a little sucky. But hopefully, most of us are performing tasks we like or love, so that it doesn’t seem quite so much like “work” … or apply whatever other coping mechanism does the trick! The Google+ Social Network: Net Plus or Net Minus? What’s the latest with Google+? The big splash predicted when the new social platform hit the web has been more of a ripple instead. Underscoring this, recent news reports have suggested that Google basically missed the boat on social media … and that rival Facebook is far too well-established to face anything more than just token competition going forward. It’s true that many people find the prospects of building and engaging in yet another social media channel a wearying thought, to say the least. There are, after all, only so many hours in the day. But Google doesn’t want to cede the social media marketplace to Facebook without a fight. That’s understandable, considering the billions of dollars in potential advertising revenues that come from being able to serve ad messages to people who are connected to others who “like” a product or service. The results charted to date on Facebook confirm that displaying friend “likes” adds an extra measure of credibility to advertising. That’s manifested in a clickthrough rate that’s three times what’s typical for other advertisements on the social platform. The launch of Google+ this past summer hasn’t resulted in huge user adoption, that much is clear. The Google+ social platform has managed to nab ~40 million users, which isn’t a shabby number in and of itself. But it pales in comparison to the more than 800 million active users on Facebook. But despite this less-than-stellar performance, we see clues as to where Google is going with its social platform. That’s because Google’s equivalent of the “like” button – the “+1” notation that shows up on Google’s search engine results pages – goes further than simply communicating the news to those in someone’s own Google+ network. Google is also mapping that information through to its Gmail account base. Google’s Gmail service has hundreds of millions of users, and those who use the site regularly have accumulated dozens or hundreds of contacts. So when a user clicks +1, Google can show that result not just to the user’s social friends on Google+, but also to his or her contacts in Gmail. Not long ago, I blogged about how the Internet has become as fundamental to our existence as the very air we breathe. On any given day, millions of people log on to the web to find answers to any number of questions they may have. But despite the limitless subjects that are the topic of these searches, it turns out that search behaviors can be divided into three distinct categories.  Answer Me – People in this mode want answers to exactly what they’re asking for … no less and no more. They also want the answers delivered to them in the most direct way possible. 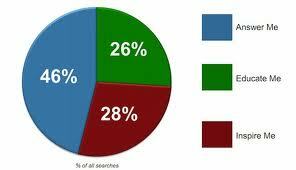 These types of queries are the largest component of searches … representing ~46% of all searches.  Educate Me – People in this mode are looking for comprehensive understanding on an issue, and they’re usually interested in multiple perspectives. They’ll search until their goal is satisfied … and this may occur over a lengthy period of time and through multiple searches on related topics. These types of queries make up ~26% of all searches, and they’re often on topics like finance and healthcare.  Inspire Me – The third category of queries are the creative, exploratory type of search where people have an open mind, are willing to be led, and are open to surprises. These types of searches represent the remaining ~28%, and are often on topics pertaining to the arts, hobbies, travel, home inspirations and gardening. The Latitude Research report recommends that web sites include content that can appeal to all three categories of searches … although there will usually be a preponderance of one type over the others depending on the market segments, products and services involved.  For “answer” searches … it’s wise to feature product/service benefits, in addition to presenting content in quick, easy-to-find answers. Clearly defined “selling” pitches work well in this setting.  For “educate” searches … present informative content that also provides ways to explore more facets of the issue … plus offering relevant links to additional online information sources. The “selling” in this case comes more in the form of educating and informing.  For “inspire” searches … focus on sparking the imagination of site visitors, with “surprise” moments that will generate interest and spur creative thought. When this is done effectively, strong sales pitches don’t need to be pushed because the viewer will be drawn into the buying process naturally and effortlessly. For more on the interesting findings from the Three Mindsets of Search research study, click here. If anyone was hoping for good news at the end of the year, it’s not coming in the form of increased holiday spending by consumers. The National Retail Federation’s annual Holiday Consumer Intentions & Actions Survey concludes that holiday shoppers plan to spend an average of just over $700 on holiday gifts and seasonal merchandise. That’s down slightly from last year’s holiday spending plans, which were closer to $720. After having grown to more than $750 in the 2006/07 period, a significant drop-off was seen in 2008 and 2009. With the recession bottoming out, this was followed by a tidy little jump in holiday spending 2010. But just like the rest of the economic picture, things have stalled since then – or pulled slightly back. In another recent survey, Ipsos Public Affairs has found that women are more likely than men to be planning to cut back on their holiday shopping outlays … as are people over age 35 compared to younger adults. Despite the slightly lower figures for intended holiday spending in 2011, the National Retail Federation’s survey finds that nearly 40% of consumers will have already started their holiday shopping in October. A similar 40% plan to start shopping in November, while the remaining 20% won’t begin their shopping activities until September. What about you? Do your holiday shopping plans for 2011 mirror what the NRF survey found? Listening to the computer voice, it’s clear that Siri is a “she,” not a “he” … which has some journalists thinking about the fact that computer voices are overwhelmingly female. There are some exceptions. The famous “You’ve got mail!” voice from AOL’s dial-up days is one. Plus the fact that nearly all voice-activated features in Germany utilize a male voice. But otherwise, it’s nearly universal that these voices are female. The question is why? Clifford Nass, a professor of communications and computer science at Stanford University who has studied this topic closely, contends that it’s much easier to find a female voice that people like rather than a male voice. “It’s a well-established phenomenon that the human brain is developed to like female voices,” Nass maintains. As proof, he cites a study in which fetuses were found to react to the sound of their mother’s voice … but not to their father’s. I think another reason may be acclimatization. During World War II, my mother worked in air traffic control at the Parris Island Marine Corps Base. There were only women working these positions, and for a very practical reason: Their voices really stood out in the cockpit among the male pilots. And what about telephone operators? For decades, they were nearly100% female voices. Beginning in the 1980s, when auto makers first began installing automated voice prompts in cars (remember “Lights are on” and “Your door is ajar”? ), consumer research found that drivers overwhelmingly preferred female voices to male ones. So is it any wonder that nearly all GPS navigation systems today have female-sounding speech as the default voice? Not surprisingly, there are some people who contend that using a female voice as a “virtual assistant” is sexist in nature. But I’m not sure we can attribute “overt” sexism to the choices companies have made in this regard. Like with the auto companies, these decisions are probably based on market research. So at best, it’s possible that the choice reflects some gender stereotyping that already exists in the general public. On balance, I think it’s a positive that so many computer voices are female. After all, these voices have been selected based on attributes like warmth, friendliness and competence. If that makes it sexist, so be it … but it puts most of the gold stars on the female side of the ledger, that’s for sure! Online coupon deals: Take those “whopping” discounts with a grain of salt. That "big discount" you think you're getting? Chances are, it's based on inflating the regular price. In the world of retail, while the way people buy goods and services may be evolving at a rapid clip, it turns out that some aspects have changed nary a bit. Take online couponing. Groupon and LivingSocial are the two big players in this segment, which enables consumers to take advantage of deep discounts on products or services providing enough people sign up for the offer. They’ve been proliferating in retail markets all over the country. But think back to the “bad old days” of brick-and-mortar retail. Often, you might encounter a “deep discount” at a grocery store or big box store, only to realize later that the discount was calculated off of an unrealistically high list price for the item. While not illegal, such practices are certainly deceptive, in that the product was rarely if ever sold at the “standard” price. Well, guess what? When looking at online coupon deals, we’re now finding the very same practices at work. Recently, local local services online directory Thumbtack contacted vendors offering daily deals from Groupon or LivingSocial. Vendors were “shopped” in metro markets all across the country that included a variety of services ranging from home cleaning and maid services to interior painting, handyman services and studio photography. In eight out of ten cases, Thumbtack found that it was quoted a price over the phone that was lower than the advertised “regular” price cited in the supposedly “great” deals being offered.  On September 19, 2011, Groupon offered two hours of home cleaning services in Phoenix, AZ for $49 … an amount it claimed was 67% off of the “regular” price of $150. When contacted by phone, the non-discounted price for the exact same cleaning services was $80. So the consumer was still getting a discount … but hardly the 67% as breathlessly claimed.  On August 24, 2011, Groupon offered carpet cleaning services for a 200 sq. ft. area in San Francisco, CA for $45 — purportedly a 78% discount from the regular price of $200. The price quoted over the phone for similar square footage? Just $106. No doubt, Groupon, LivingSocial and their participating vendors realize that one way to make an offer more attractive is to make sure the percentage discount is huge – and thus unlikely to be offered again. It’s really no different from practices we’ve seen used in retail over many years. But as more consumers become more savvy to the ways of online deals, it’s quite likely that we’ll find fewer people choosing to participate in them based on the “whopping” discounts claimed.